Providing care for your own mother or father is something that many children simply expect to do as they grow older. It is becoming the norm that grown children act as a caregiver in some capacity for their parents. Meanwhile, the thought of providing elder care for aging in-laws hits many spouses off guard. While you may not have thought about assisting your mother-in-law in the restroom or helping your father-in-law get dressed, providing care for in-laws is a reality that a vast percentage of the 45 million Americans acting as family caregivers are facing. Providing for the basic needs of your own parents can be awkward enough, so how do you handle caregiving for in-laws? The answers will vary, of course, based on your relationship and comfort level. However, these few basic tips can help family caregivers, and their in-laws, have a pleasant elder care experience. 1. Realize that the relationship will change. The way that people feel about their in-laws can run the gamut from love and respect to utter dislike. Evaluating your relationship and realizing that it will change as you become a caregiver is imperative to the wellbeing of both you, and your in-laws. If you’ve had arguments in the past, take time to sit down and try to resolve your differences, or simply agree to let bygones be bygones. Holding grudges can lead to resentment about your caregiving duties and be detrimental to the overall wellbeing of the caregiver and care receiver. Conversely, if you’ve had a positive relationship, express your gratitude to your in-laws and realize that new frustrations may arise. You may experience bumps in the road that haven’t been present in the past; take each as they come. This is a new chapter for all of you! 2. Establish boundaries that you both feel comfortable with. Let’s face it: your mother-in-law may be okay with you helping prepare meals and keeping up with the laundry, but helping her in and out of the shower might be too awkward for both of you. Or maybe not. 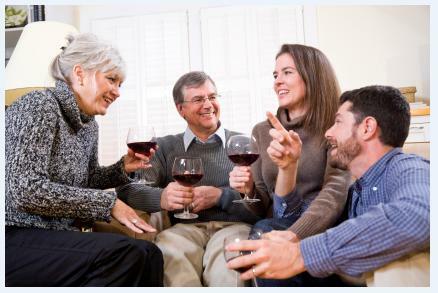 Sit down with your in-laws and spouse to talk about what kinds of help they are open to receiving from you; as well as what you feel comfortable and capable of doing. Respect one another’s boundaries and re-evaluate “the rules” as their needs and your comfort level evolve throughout the caregiving experience. 3. Nurture your relationship with your spouse. While acting as a caregiver for your in-laws, both you and your spouse will encounter new frustrations that commonly lead to stress. Setting aside time for each other will help prevent undue strain on your marriage. Speak honestly, yet respectfully about any issues or irritations that arise while caregiving, and provide support to one another. Remember, this is difficult for all of you. Don’t hesitate to reach out for help from a counselor or local support group if you are having trouble navigating this transition. 4. Utilize in-home care providers. Take advantage of the assistance offered by private duty elder care agencies. If your in-laws are uncomfortable with you or your spouse helping them bathe, yet they need assistance, recruit the services of an in-home care provider to come and help with tasks that are beyond your level of comfort. In-home care will also provide you with time to handle other responsibilities, like work and your own family, and allow seniors to feel like less of a burden to their family. When choosing a care provider, be sure to request that the agency utilize ClearCare homecare software. With the power of ClearCare, you’ll be able to see what tasks are completed, in real-time and be assured that caregivers are accountable and on-task. Family caregivers have become the backbone of independence for American seniors. By providing basic care for your in-laws, you are giving the gift of extended independence, and granting them the ability to stay at home for as long as possible. Remember, it won’t always be easy. Take a deep breath, work as a team with your spouse and take advantage of the resources available to make your caregiving journey less stressful.